Preheat a large frying pan with 1 tsp olive oil, add 2 packs Unsmoked English Gammon Steaks (weighing about 170g each) and cook for 4-5 minutes, turning halfway through. Once cooked, remove and keep warm. Return the pan to the heat and stir 1 tbsp dark brown muscovado sugar into a 250g pack fresh pineapple pieces before tipping into the pan. Cook over a high heat for about 2 minutes or until the sugar has melted, coating the pineapple, and ensuring it is heated through. 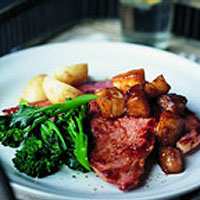 Serve the gammon with the caramelised pineapple, tenderstem broccoli spears and organic baby new potatoes.